OSIRIS image of a 228 x 228 meter region on Comet 67P/C-G. Rosetta’s shadow can be seen at the bottom. See the image above? It’s the surface of a comet. Pretty cool. See the dark spot along the bottom? 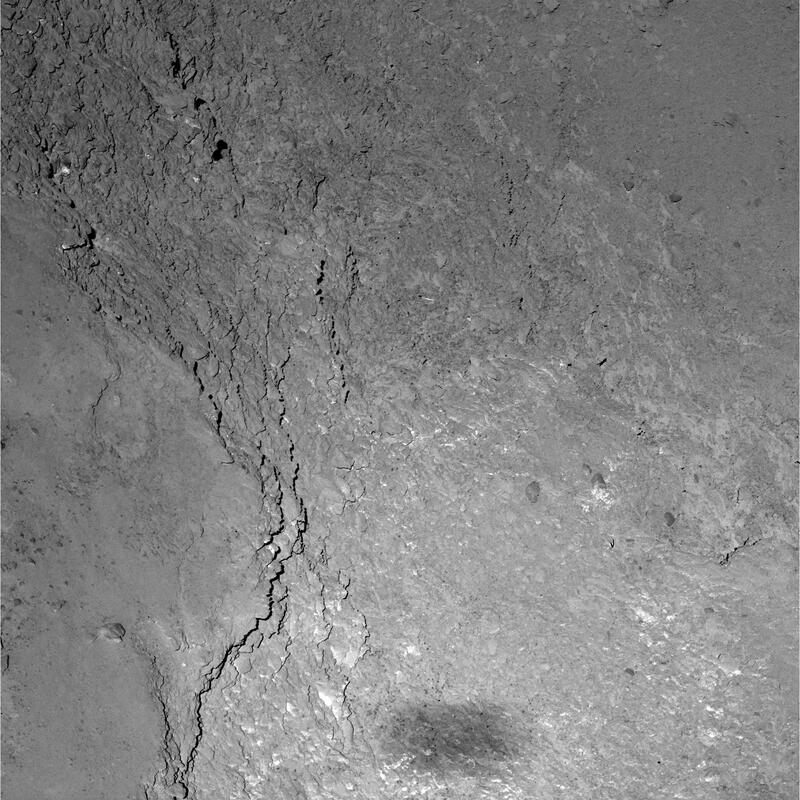 It’s the shadow of the spacecraft that took the image of the comet. On February 14 – yes, Valentine’s Day ❤ ❤ ❤ – ESA’s Rosetta spacecraft made its closest pass yet of comet 67P/Churyumov-Gerasimenko, coming within 6 km (3.7 miles) of its surface. As it did it captured images with its high-resolution OSIRIS camera, and just when it made its closest approach its shadow flitted over the comet’s surface and was captured by the imager. The area that’s shown in the image above is illustrated in the series of zoomed views below. 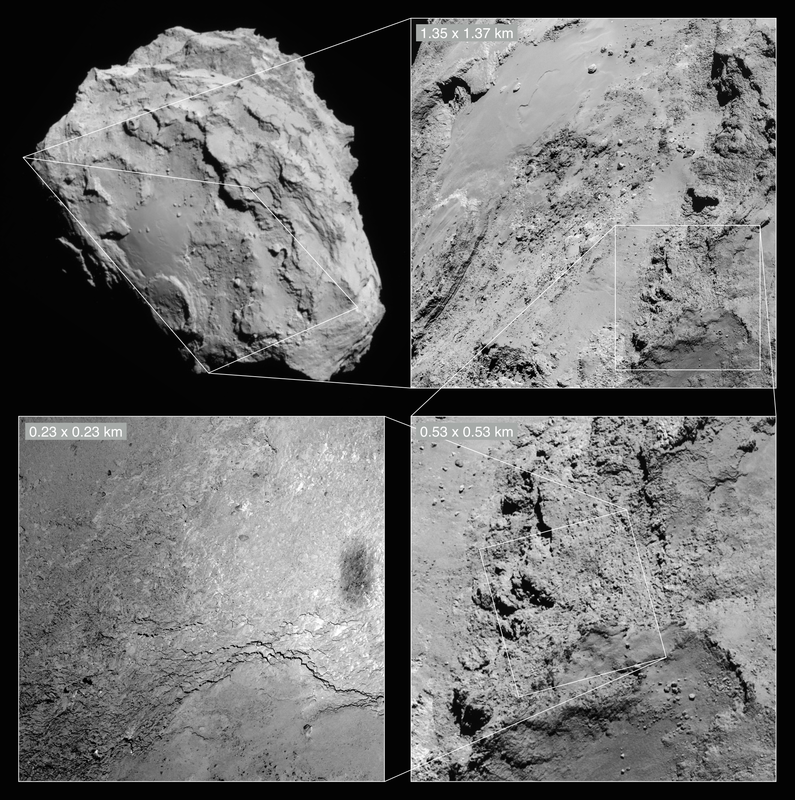 NavCam images used to put the OSIRIS view in context. 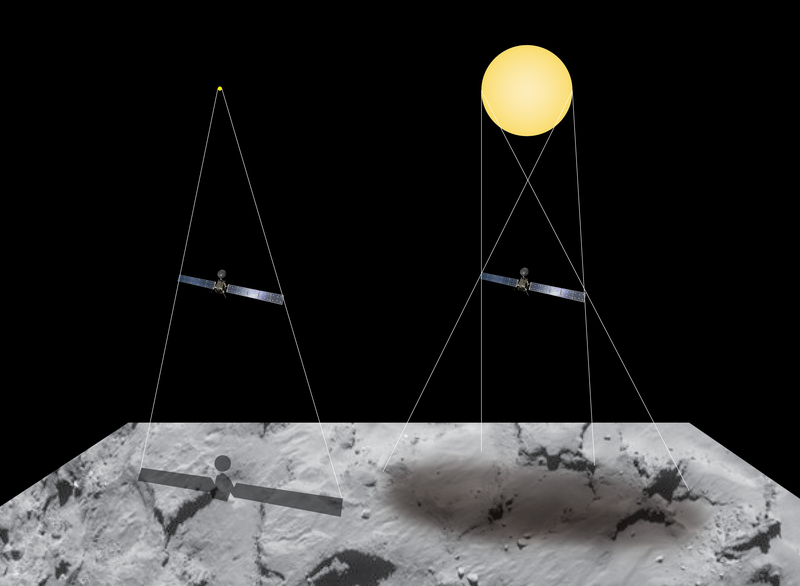 Because the Sun was directly behind Rosetta at the time of the pass – which was good for imaging as it provided very even illumination – its shadow was able to fall onto the comet. Because the Sun is not a point source of light Rosetta’s shadow is fuzzy around the edges. And since the spacecraft isn’t large enough at 6 km to completely block the Sun, its shadow isn’t totally dark either. Plus there’s a noticeable increase in the brightness of the comet’s surface surrounding Rosetta’s shadow – this is a result of surface material reflecting light directly back at the camera in much the same way that the Moon is considerably brighter when full than at any other time, an effect called “opposition surge.” Read more here. Next Post Could Humans Set Up Camp in Martian Lava Tubes? This is such an interesting set of images.